Webcam La Mesa, California: City View - A view over La Mesa, California, with current weather data. La Mesa, California: Helix Charter High School, 4.5 mi. San Diego, California: SB 15 and SB 805 (Intersection), 9 mi. San Diego, California: San Diego Zoo Polar Bear Plunge Exhibit, 11.1 mi. San Diego, California: San Diego Zoo Ape Exhibit Cam, 11.1 mi. San Diego, California: SB 163 JSO Rte 8, 11.7 mi. San Diego, California: SB 15 at Miramar Rd, 12.2 mi. San Diego, California: NB 5 JNO Laurel, 12.4 mi. Chula Vista, California: SB 5 JNO H St., 12.5 mi. 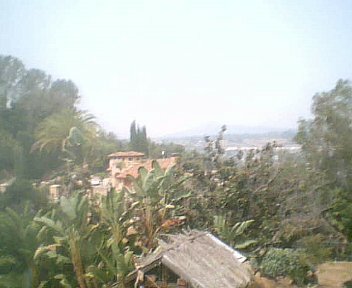 This webcam La Mesa, California with the theme City Views was added on March 1, 2011 and is operated by rdibbxsh@WeatherUnderground. It got 1430 visitors since then. Shouldn't this webcam work or should the link be wrong please report that here. You can add this webcam here to myCams.